The same knife, just better. 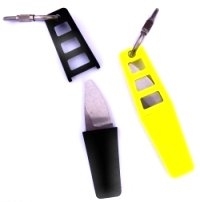 The Xtra Edge is a superb choice as a watersports, pocket, neck, or keyring knife. The blade is unobtrusively stored in a twist-loc sheath. Titanium Drop-Point alloy diving knife is constructed of Ti6AL-4V titanium, completely corrosion resistant. Blade has a remarkable fine hollow ground cutting edge.